This entry was posted on Thursday, April 29th, 2010 at 1:30 am	and posted in Uncategorized. You can follow any responses to this entry through the RSS 2.0 feed. this shows us that th present generation of sikhs havent accomplished anything, if thousands watched sikhs parade on by, and not a single person was informing the public. 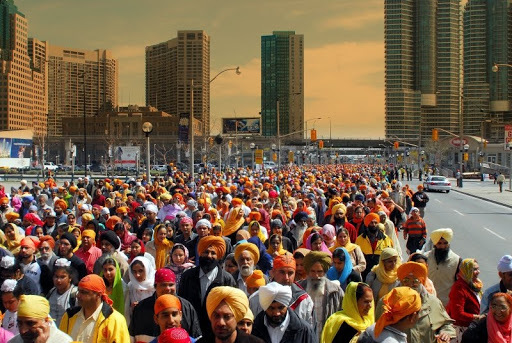 the nagar kirtan is the perfect time to educate the public as they watch the collective panth go by in unity. I suggest that pamphlets or even signs be made explaining the purpose of the nagar kirtan and what sikhs are. I agree we need to show the Guru Nanak in us, however they need to know who exatcly he was along with our other Gurus. We have long ways to go, Anonymous…but I wouldn't say this present generation of Sikhs haven't accomplished anything. Take a look at my last post, titled "Good PR." The Sikh Coalition and Texas sangat have done an awesome job working toward getting Sikhi included in the state-wide educational curriculum.